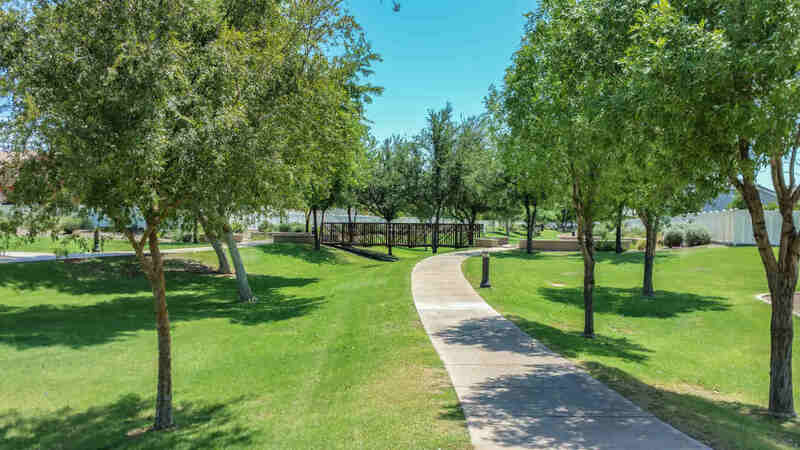 Craftsman style homes, precision cut grass, community grown fruits, veggies, and a whole lot of different is what you will find in the community of Agritopia in Gilbert, AZ. Built in the booming era of widescreen televisions, tablets, and computers this new "agrihood" is just what this large Phoenix suburb needed. Gilbert, Arizona for years was known for all of it's farms and not for it's real estate, but times have changed. Where farms once were are now miles and miles of homes, built for the ever growing real estate need in Gilbert, AZ. In 1960 Joe Johnston bought the farm that the community sits on today. In those days the Johnston family grew crops such as cotton and wheat as that was the crop of choice at the time. The family built a house on the property which has since been converted into "Joe's Farm Grill", where they serve up all kinds of fresh food grown right from the farm. In the early 1990's Joe began selling off parts of the farm to developers due to the rapidly growing real estate market in Gilbert. Joe saw where the town of Gilbert was heading so he began to make plans for the future. His vision was clear and so he arranged an agreement with Scott Homes to start the build out. His vision was to "honor God and the area's agricultural heritage", so he built a community around a large portion of the working farm. Johnston said "The people make the place neighborly, "but it is also the way you design the setting. The way the homes are done...the streets are done to deemphasize cars. All those make for a more neighborly neighborhood and attract people, who want to be social." Agritopia's streets are smaller and more narrow, and the fences are shorter instead of taller. All of this to promote a more social and neighborly spirit. Agritopia is 160 acres in size and is located at Ray rd. & Higley Rd. The streets of Agritopia are lined with beautiful trees and green grass, something that is a rarity in Arizona. The community is comprised of miles of walking trails leading to the Agro-commercial area and eventually to the town square. 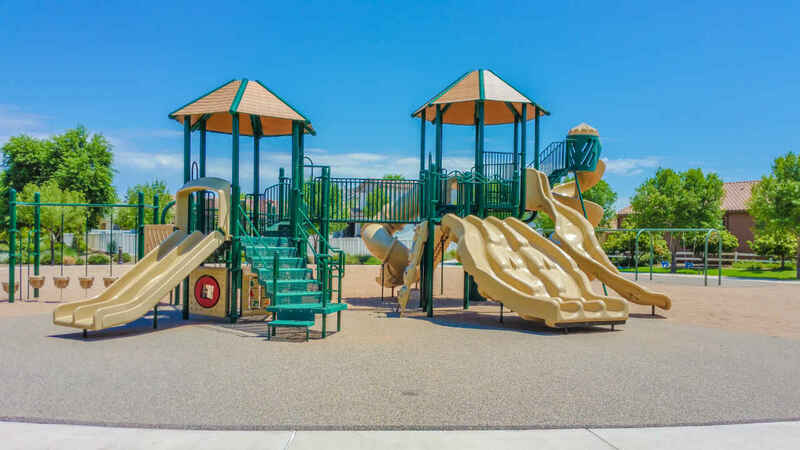 There are 5 Play Grounds, 2 volleyball courts, 5 basketball courts, 1 tennis court, community center, and a community pool. The craftsman style homes are unique and have open porches, many of which have porch swings which give it a bit of a Southern feel. Instead of the traditional Arizona block fencing, the community and homes are separated by white vinyl fencing. All of these unique features contribute to the ease of a more social and relationship building community. 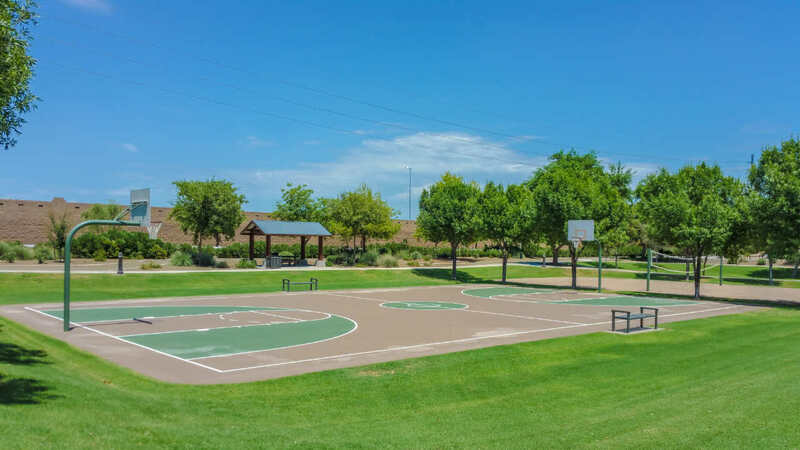 Agritopia sits adjacent to the Cosmo Dog Park which is an attraction that is used daily by Gilbert residents. 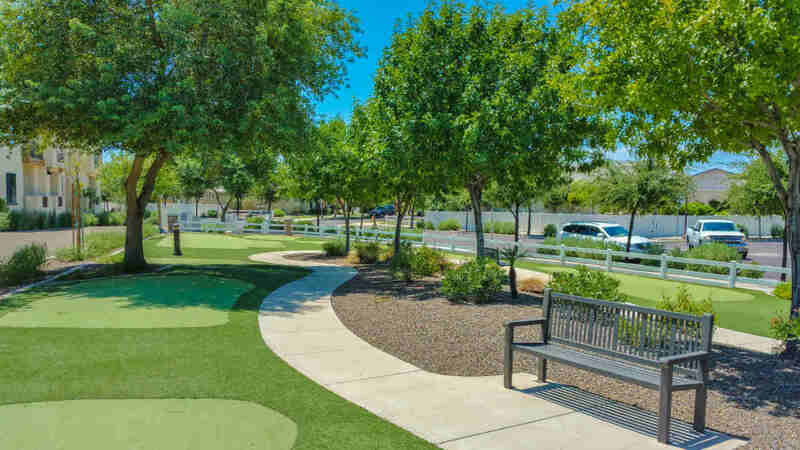 The Chandler-Gilbert Community College, ASU Polytechnic, Phoenix-Gateway Airport, San Tan Village Mall & shopping center, Mercy Gilbert Hospital, Crossroads Park, Toka Sticks Golf Course, National restaurants, and Topgolf are just a few of the local attractions within minutes of the community. Agritopia has an organic working farm centering the community where you will find rows of crops like fruit trees (peach, cirtrus, apple, olive, date) and rows of a variety of veggies and spices. The Agritopia farm even has chickens, sheep, and bees that act as fertilizers, cultivators, and pollinators which are essential to the crops. Every Wednesday for just a $100 a month residents can pick up their box of freshly harvested fruits, veggies, eggs, and honey. Agritopia even has a community garden where residents and non-residents alike can lease a 20 x 20 ft. plot where they can grow and care for their own crops. 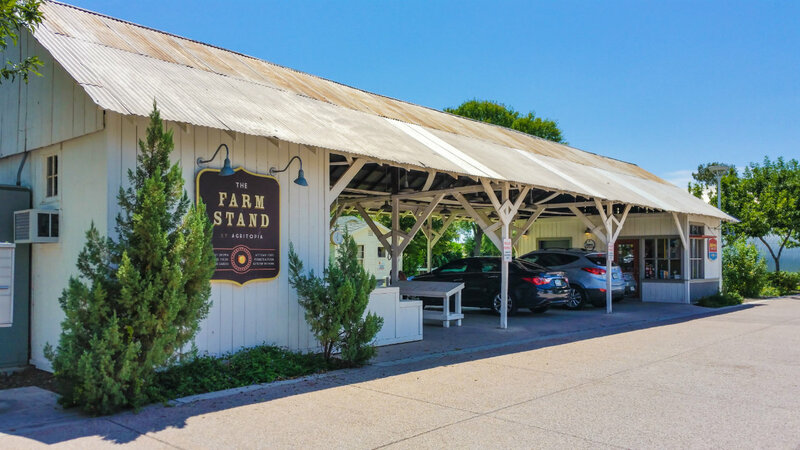 The farm also provides fresh fruit and veggies to the on site Coffee Shop, Joe's Farm Grill, and other local restaurants in the area. The public is also welcome to shop at the community farmers market "The Farm Stand At Agritopia" . In Agritopia you will find The Coffee Shop, which is owned by the Flowers and Cuff Families. They feature all homemade recipes and fresh ingredients, many of which come direct from the Agritopia Farm. 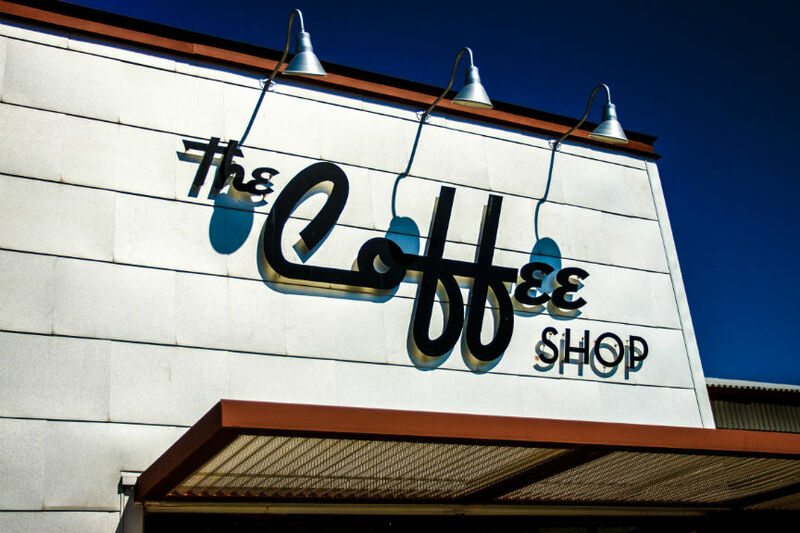 Freshly brewed coffee and dozens of combinations of espresso's are the shop's strengths, but they are no slouches when it comes to their food or delicious cupcakes. The Shops very own Jessica Cuff and sister Jenna Flowers appeared on Cupcake Wars on Food Network. If coffee isn't your cup of tea, then head next door to Joe's Farm Grill where their focus is on "common food done uncommonly well and served quickly". Burgers, fries, pizza, salads, and ribs are a few of these common entree's. They use healthful ingredients and hand craft their sauces, dressings, and marinades, that once again come mostly from the Agritopia farm. 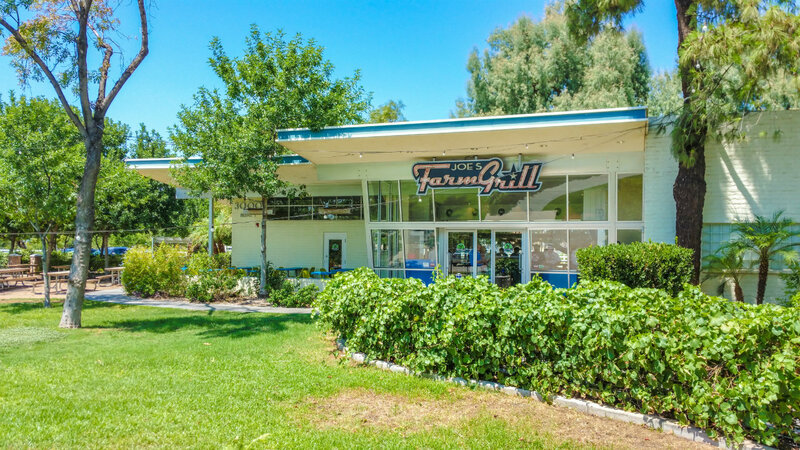 Joe's Farm Grill was also featured on Food Network: Diners, Drive-ins and Dives. Additionally, there is a senior living facility within the communtiy, (Generations at Agritopia). This facility completes Joe Johnston's vision of what Agritopia was to be. The facility is ready to provide seniors with a lifestyle like none other. 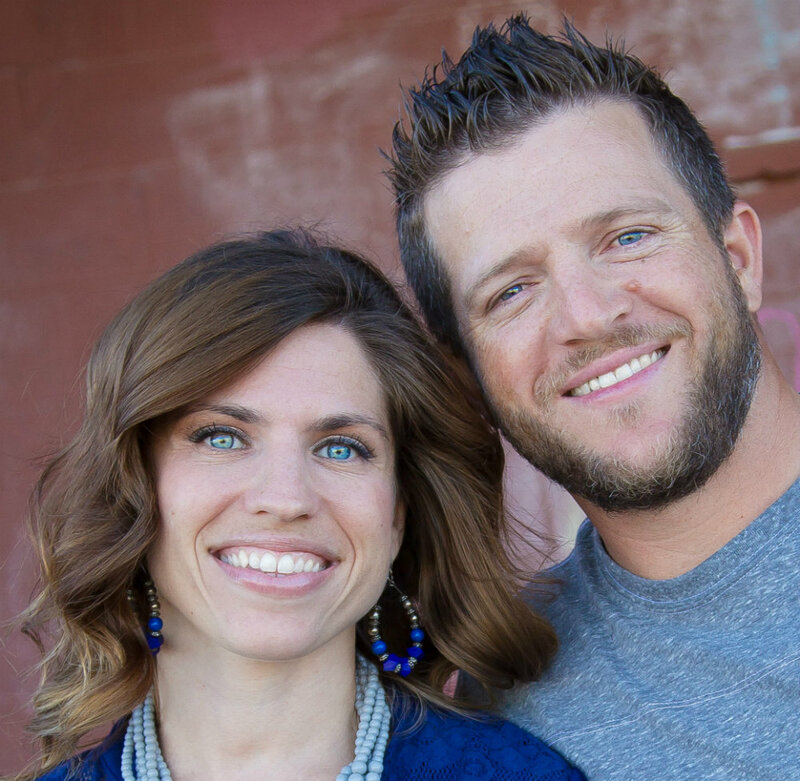 The community also features Gilbert Christian Schools, a private preK-12 grade school with a capacity of more than 450 students. The school focuses on fine arts, community involvement, and spiritual development. Agritopia is comprised of 452 homes. They range in size from 1,300 square feet to more than 4,000 sq. ft. when equipped with the optional basement. Some of the homes have a "bungalow" unit which can be used as an additional residence or a place of business. 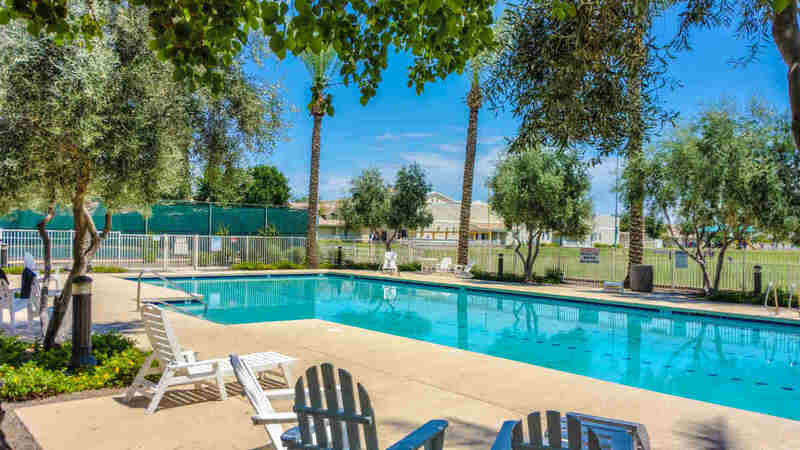 Agritopia offers a great relocation opportunity for those who wish to be located in an affluent part of Arizona, a state with low taxes, great schools, wonderful business opportunities, and recreation options that will never leave you without something to do. 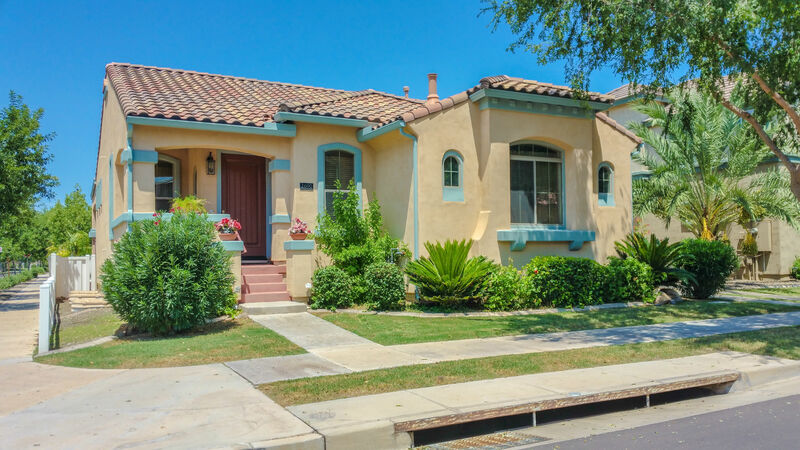 Selling your Agritopia home? Get your home value instantly below.